Either W is big fan of Van Halen or January 14th is the anniversary of the day he banged Valerie Bertinelli on a coke rampage during a Van Halen concert. Please HolyJuan, tell me it is the second option. Otherwise I'll never be able to listen to Van Halen again. 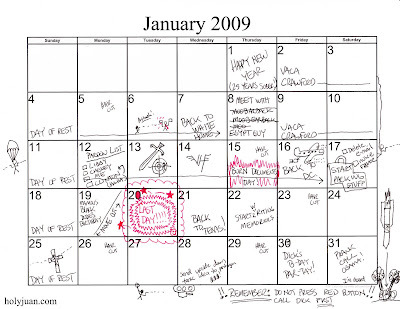 Wow....who knew you had high level security clearance and are allowed to view the presidential calendar?! I am in awe! what's with all the haircuts?? I'm assuming he is very clean cut or it is code for something. Note to self: Change Google calendar, Burn Documents Day on the 15th ! "Pardon List: Clinton (HA HA)"
I am Brazilian and I am here in Brazil. His schedule became news around here. the site www.g1.com the published today, although you have written in March. Fantastic, very creative. I don't speak English but they reflected the most important day.